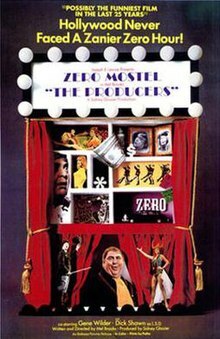 MGM (who owns video rights to select Embassy Pictures titles that ended up with Nelson Entertainment and Polygram) released The Producers on Region 1 DVD in 2002, and reissued in 2005 to coincide with the remake released that year. In 2013, MGM licensed the title to Shout! Factory to release a DVD and Blu-ray combo pack with a new HD transfer and newly produced bonus materials. StudioCanal (worldwide rights holder to all of the Embassy Pictures library) released several R2 DVD editions using a transfer slightly different from the North American DVD and Blu-Ray releases. In 2018, StudioCanal gave the film it's European Blu-Ray debut in the UK, Germany, and Australia. The StudioCanal releases port over most extras from the Shout! Factory release and use a brand new 4k remaster. ^ "Radio Times". November 24–30, 2001.